Episode 3 of The Flow Podcast by TheSamsara.me is now up. You can download on iTunes or listen using the embedded player on my site. The FightWorks Podcast #251: BJJ Gi Survey! You spend a lot of time on the mats. It’s what Brazilian jiu-jitsu people do. You also may spend a lot of money to train BJJ. For example, we know that even two years ago more than half of the people who train were paying more than $100 per month for classes! In the same way you want to make sure you get the most value for your training dollars, you want to also know that the gi you buy is going to give you exactly what you expected. Gis are expensive too, right? And the average price of a gi seems to be going up every year though many would probably say that the quality of the average gi is not changing very much. Luckily there is someone very passionate about gathering information about gis out there. Aesopian, aka Matt Kirtley, began collecting information about jiu-jitsu practitioners’ opinions in 2009. And he’s now collecting data again! Even if you never get a chance to listen to today’s show, it’s important to take the 5 minutes and participate in the survey. Knowledge is power, so help make the jiu-jitsu community stronger by sharing your information in his survey! I stumbled across your gi survey a while back and came back to it this weekend as I was looking for a new gi to buy. I decided to have a quick crack at analysing your dataset (actually just the question about favourite gis). I cleaned up the data by using only responses from people who owned at least 2 gis, and who had listed one of those as their favourite. After that, for each pair of the 21 gi brands that were owned more than 10 times in the dataset, I counted the number of time the 2 brands were owned together and one of them was listed as the favourite, and which one was the favourite. I then ran a quick statistical test on the pairwise comparisons. I also summed up the numbers for each brand, to get an overall value of a brand versus all the others and ran a statistical test on that too. 1) Shoyoroll seems to be the best brand overall by quite a margin, so if you want the best gi no matter the price, this is your best bet. 2) Sirius and Padilla & Sons really stand out as the best deals by far given their high ranking and low price compared to every other brand analyzed. They both have very comparable rankings and prices so it’s hard to recommend one over the other. 3) If you want to try something different, go for Isami (but consider Shoyoroll, Sirius or Padilla & Sons first). 4) Of the 6 major brands identified in the survey (Atama, Koral, Gameness, HCK, Keiko Raca and Vulkan), Vulkan seems to be the best, followed in order by Koral, Keiko Raca, Atama, HCK and finally Gameness. So if you want a gi from one of the big brands, go for a Vulkan (or perhaps a Koral if you really don’t want a Vulkan). 5) At the other end of the spectrum, Krugans, Adidas and Kikskin seem especially bad. This is a quick and dirty analysis but I hope you’ll find the results as interesting as I did. It actually made me buy a Padilla and Sons straight away, given the overall results above versus the price of the gi (plotting proportion against price would be an interesting graph too). Skip to 14:40 for the finish. Link to Youtube video. More videos of Seiji hitting this move in tournament are posted in the comments. “I first came across Matt’s (Aeso) rants on the virtues of the crucifix position and reverse omoplata as a white belt with less than a year’s experience in jiujitsu. I thought that the technique looked really cool and began looking for the position during rolling. It wasn’t until I used the technique to win a match while I was still a white belt that I started taking the position seriously and began corresponding with Matt to troubleshoot the technique as well as working with my coaches: Shah Franco, Marco Costa and Richard Nancoo, on integrating it into my game. “For the past few years I’ve slowly been accumulating wins by reverse omoplata in the blue and purple belt divisions of the local tournament circuit. Ever since I had my first professional MMA bout last year I’ve had the thought in the back of my mind that one day I’d like to finish a fight by reverse omoplata. During my most recent fight, hitting the technique was the furthest thing from my mind, but when I felt my opponent’s arm grab my leg I went to the position instinctively. After executing the technique I think I was probably as surprised as my opponent as well as everyone else in attendance. Want to learn the move? The original reverse omoplata tutorial is up here. Stephan Kesting emailed me last week to let me know about a freeBJJ/grappling DVD he is releasing and I wanted to pass the word along to everyone. You can watch a preview here or sign up to get the DVD here. I own all of Stephan’s DVDs and have been a big fan of him and his sites (Grappleart.com and the newer BeginningBJJ.com) for years. It’s awesome that he is putting out this DVD since his original instructionals remain some of my favorites. For those of you wondering, my knee is healing up fairly well and I’ve been easing back into training. Not 100% yet but it’s doing as well as I could hope. Leave a comment and let me know how your training has been going! Update! You can get 5 more tips in The FightWorks Podcast at the tail end of a really interesting show about the Pan Ams. Get it here. This week Caleb of The FightWorks Podcast had me on to go over the first 5 of the 10 Quick Tips for White Belts. More interesting than that is Caique got his red and black belt from Rickson and sat down to talk about his introduction to the Gracie family, jiu-jitsu back in the day in Rio de Janeiro, his arrival in the United States, jiu-jitsu today, and much more. Check it out! Here are the results of the BJJ gi survey. A second survey will be coming out soon that fixes some problems with the first. For example, you couldn’t match durability or sizing problems to a specific gi (since they were all lumped together). The data collected could be sliced and analyzed in more ways than I’m showing below, so I’m offering it in CSV for anyone who wants to crunch the numbers. Here’s an example: The top three favorite brands were Atama, Gameness and Koral. But that’s not a big surprise when they are the three brands most people own and most people only have 1-3 gis. What would be interesting to see is of the people who own these brands and others, are they still their favorite? What do you like in a gi? I’ve been wondering what people like and dislike about BJJ gis, so I put together a survey. If you include your email address, you’ll have a chance to win and have me record personalized instructional video on whatever you want. Stephan Kesting of Grapple Arts just launched an awesome new BJJ resource, Beginning Brazilian Jiu-Jitsu (beginningbjj.com). 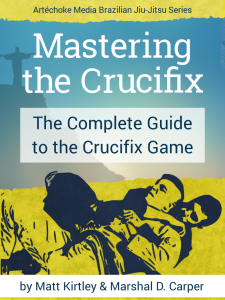 Signing up for the e-course gets you a free e-book, A Roadmap for Brazilian Jiu-jitsu. After reading it, my first thought was “I wish I’d had this when I started.” It’s a superb starting reference, presenting the right lessons and concepts for a beginner. The e-mails that come with the e-course are the same great quality all of Stephan’s work is. If you run a gym, this would be a perfect to give to new students. I’m thinking of printing out a copy and bring it into the gym and telling the beginners to check it out. It presents the right mindset for learning and improving as a beginner. Jeff Rockwell is a brown belt under Ricardo de la Riva and runs a DLR affiliate school, teaching BJJ and MMA at LionHeart Fitness and Mixed Martial Arts in State College, PA. You can find the address and schedule at myspace.com/rockjitsu. Jeff Rockwell and Ricardo de la Riva. How did you get into BJJ? I got into the martial arts the same way a lot of people my age did: I saw Bruce Lee and I wanted to be just like him. My parents never really wanted me to get into martial arts as a kid, though, as they thought it would encourage me to fight. So I just watched movies, read books, and dreamed of defeating a room full of thugs with my nunchucku. Once I finally left home for college, I decided to find a place to start training. Luckily for me, there was a Jeet Kune Do club right on campus, so I jumped right in and joined up. Working with them led me to an actual school in Maryland, where I trained for several years. It was great, we trained a bit of everything – boxing, Muay Thai kickboxing, Jun Fan, kali, silat, sambo, shootwrestling, and jiu-jitsu. So I got exposed to a lot of ideas and styles. There was very little sparring or live rolling, however, so while I learned a lot, the timing under pressure just wasn’t there. I gravitated towards jiu-jitsu and thai-boxing, and I started training at another gym as well. This gym was a Rigan Machado affiliate, and it was there I really got baptized in the jiu-jitsu fires… I quickly learned that all the leglocks and neck cranks in the world don’t help you if you can’t escape the side control of a seasoned jiu-jitsu practitioner. It was really tough…I got pretty discouraged at one point and actually gave it up for a few months. But the love of jiu-jitsu I had developed was deeper than the frustration, and when I went back, I found some very encouraging training partners who helped me through that period. Since then I have moved around the country a good bit and been at many different gyms, and I’m happy to say that I’ve never had to take more than a week or two off from training. How have the demands on you changed since you started teaching at your gym? Teaching full time is very demanding! In the mornings, I usually teach a private BJJ session for our MMA fighters, then I teach a lunchtime public BJJ class, then I lead a two-hour MMA team practice for our fighters, then I teach another public BJJ class in the evenings. On some days I squeeze in a private lesson for one of my students in there as well. I take four or five showers a day sometimes! I don’t have much down time these days, but I can’t complain, I love what I do. Do you have any trouble balancing your personal development with teaching and running classes? It is definitely a challenge to balance my personal development and that of my fighters and students. With the schedule I currently have, it’s pretty hard to find extra time for extra cardio, weightlifting, technical drilling, and other things I need to do to stay in competition shape. Plus, it is hard to keep up this pace and stay injury free. I am not that old (about to turn 33), but I feel like I am jumping from one injury to another these days. Nothing that keeps me off the mat completely, thank goodness, but enough to keep me from feeling I can train as hard as I would like to consistently. So that is annoying, but I just keep doing as much as I can, trying to get enough rest, and trying to find the perfect formula. I have really only been doing this job at this pace for a few months, and I am still figuring things out. I am optimistic that I’ll be able to find a good balance so I can continue to personally grow and compete at a high level, as well as teach others at this pace. What’s the current makeup of your gym experience-wise? We are still a fairly young gym, and we are primarily made up of white and blue belts at this point. A few of our blues are getting very close to purple belt level. In addition, our gym is really fortunate to have some of the best wrestlers in the country! It is not uncommon for us to have 5 or 6 Div. I All-Americans or even National Champions in our room at any given time, training BJJ, MMA, Boxing, or Thai boxing right alongside everyone else. They are incredible athletes with incredible work ethics, and they are a pleasure to train with. I learn just as much from them as they do from me, and everyone helps one another improve and evolve. With all those wrestlers, have you seen any interesting examples of wrestling and BJJ, MMA, etc. blending together? Absolutely! Off the top of my head, I have seen variations of the “anaconda” or “gator roll” choke come VERY naturally to the wrestlers I’ve worked with, along with the “Peruvian Necktie”… basically, anything with a front headlock. The wrestlers all wanted to choke people with those grips for years, so now that they are allowed to…it only takes a few sessions for them to start having fun with them. What’s cool is that they are at such a high level that they will start making stuff up on their own. They understand how the body works and how to manipulate it, so I show them one move, and they end up figuring out 2 or 3 more positions to use it from, and I end up learning from them. Sometimes they make moves work in places that “BJJ Law” says that it shouldn’t! It’s very interesting, as they all have different styles… some have speed and movement, some have crushing upper body holds, some even have the rare “heavy hips”… I am trying to get them to blend all of these together, while keeping in their different body types and personalities in mind. What are the traits you look for in a good training partner or a good student? Someone who is hungry to learn; someone who is willing to work very hard in training, but still laugh and have a good time; someone who is willing to drill the basics, over and over; someone who can easily adjust the “volume dial” of their training intensity up or down depending on who they are working with; someone who wants to teach others because they love jiu-jitsu, not because they want to feel superior. What role has competition had in your training? Do you encourage your students to compete? Competition has, and continues to, provide focus for my training. It’s easy to get caught up in the endless fancy variations of BJJ against the guys in your gym, but competition forces you to strip your game down to the bare bones and look at what you can make work against almost everyone, almost every time. It forces you to address your weaknesses and build a game plan around your strengths. Competition is the test at the end of the training semester to let you know how much you know and if you can apply what you’ve learned. Some people can get learn a lot in school never taking tests, but they are rare and very self motivated. Most people can benefit from having the type of focus that a competition brings. I never force my students to compete, but I definitely encourage it. Which of your fighters should we be keeping an eye on? Who has matches coming up? In the long run, everybody! We have such tough guys. In the near future, Paul Bradley and Phil Davis. Paul has made fantastic strides in his striking game recently, and has become a nightmare: a fantastic wrestler who wants to stay on his feet and knock you out. And he can, with either hand! He is extremely hard to take down, and extremely hard to submit. His jiu-jitsu game has taken some great leaps recently as well. In some ways, Paul takes his fighting more seriously than anyone. Phil Davis has endless potential, and is a strange combination of showmanship and humility. It’s hard to believe he’s really only been training for about 6 months. Many things come very naturally to him… others he has to really put a lot of reps in before he feels he’s got it. I have seen this very thing discourage a lot of people who are so called “natural athletes”; they can’t stand to not be a master of everything on the first try. But not Phil, he digs in and stays after practice to do 50 more reps of whatever is bugging him that day. He comes early and stays late. He doesn’t want it to be “good enough”, he wants it to be “right”. He doesn’t just want to win, he wants to win with technique that will make people take notice. He knows how good he is already, and he knows how good he can be… but he also knows that it will take him a lot of hard work to really get there, and he is willing to eagerly listen to anyone who can help him become a better fighter. He has torn through amateur competition so far, and is getting ready to make waves in the pros. I don’t see a limit to how far he can go. EVERYBODY at Lionheart has matches coming up! Our fighters don’t stay inactive for too long. Paul Bradley is fighting this weekend in Cleveland, and all of our fighters have fights lined up in the next few months. What kind of loyalty do you expect from your students and what should they expect from you? I always encourage my students to go train with other people and other gyms; as long as they promise to come back and show me any new tricks or positions they learned there! I always want my students to be exposed to as many different styles, philosophies, and techniques as possible, so they can see what is best for them. I try to show them as much as I can, even things I don’t personally use very much or prefer, but you can never know everything or even show all that you know, really. So it is best for them to be exposed to as many different points of view as they can. I am never worried about them leaving me for another gym. If that ever happens, whether for logistical or philosophical reasons, there are never any hard feelings. I always want people to feel like they are at home and getting the best training they can, in the best environment possible.